More glass. More view. More drama. 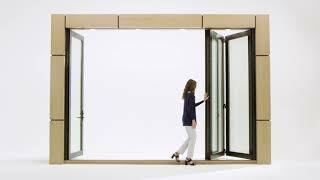 Introducing the completely reinvented Marvin Ultimate Bi-Fold Door. Bigger sizes with more glass and a cleaner, modern design aesthetic combine to give architects and builders more flexibility. Openings as wide as 55 feet make the Ultimate Bi-Fold door among the biggest in the industry. With a performance grade 50 rating, over 90 distinct configurations and countless personalization options, the reinvented Ultimate Bi-Fold door has been thoughtfully engineered to make a bigger architectural statement.